Landowners can manage streams and ponds for multiple benefits, including wildlife habitat, feeding livestock, controlling stormwater runoff, and reducing offsite sediment and nutrient transport. The rivers, streams, and riparian corridors (the vegetated area adjacent to a stream or river) on privately-owned working and wild lands are critically important for many fish and wildlife species in Monterey County. Riparian ecosystems allow movement of species along continuous stretches of land and water, connecting otherwise fragmented habitats. Many species rely on the food and shelter found in these areas, either year-round or during seasonal migrations. 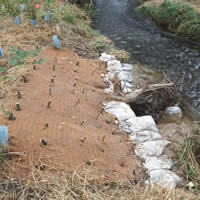 The RCD works with private landowners to enhance riparian habitat through invasive plant removal and native vegetation planting. 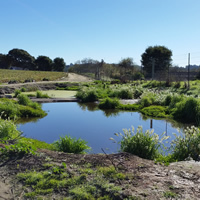 Natural and artificial ponds provide important habitat for many aquatic and terrestrial species, including threatened species like the California red-legged frog and California tiger salamander. California red-legged frogs need ponds with a mix of open surface water and emergent vegetation. Vegetation provides refuge from predators and surfaces for eggs to be attached. California tiger salamanders do not need this level of complexity and successfully breed in ponds with no emergent vegetation. The RCD can help landowners determine the best design for pond creation or enhancement to balance multiple goals.